At Melann’s Fabric & Sewing Centre, we service any brand or model of sewing machine or overlocker. Sewing Machine Repairs and servicing are Paul’s passions. He’s been caring for customers’ machines for over 20 years. Just like your car or your health, your sewing machine also needs regular check-up. Whether you have a simple mechanical machine or the latest computerised sewing and embroidery model, make Melann’s your first call. Paul Muller is an accredited International Master Service Technician with over 20 years of experience dealing with all brands of machines and overlockers. Prompt service and pre-bookings are available for busy people or those living further away or in remote areas. All machine services are guaranteed for excellence in quality. Paul can even recondition your old machine. Call Melann’s today on (08) 8337 7548 and we’ll make sure you’re in the best hands. 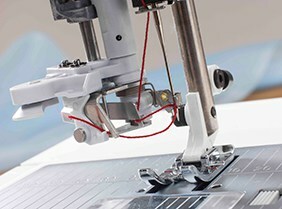 We can service all brands and models of domestic sewing machines and overlockers (PFAFF, Singer, Bernina, Husqvarna Viking, Janome, Elna, Brother etc.) If you use your machine frequently a regular service will keep your machine in good working order and running in optimum condition.